I don’t know what took me so long to embrace BAILE VIERNES. 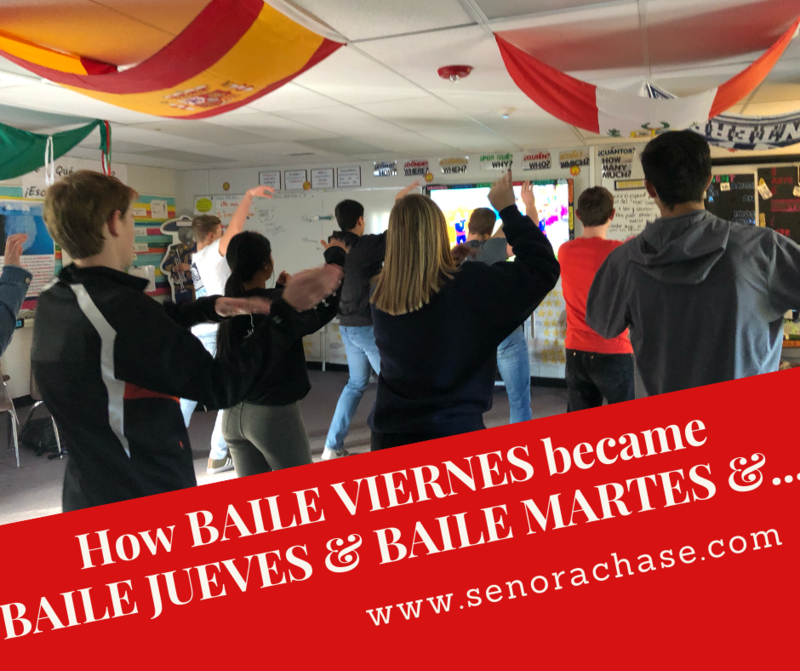 I had been hearing chattering about it and read Alison’s blog post ¡Baile Viernes! but I thought my kiddos wouldn’t be into it… I thought they’d be too cool….I thought I’d be too cool to dance in front of my students. Turns out they ARE into it. They are NOT too cool to dance. And BAILE VIERNES is my FAVORITE PART of the week! What on earth is BAILE VIERNES? It’s how we start class on Fridays, by dancing. Put a youtube dance video on, turn off the lights and cut loose! Now… we started this at the beginning of the year, on our very first Friday, and I told them very matter-of- factly that on Fridays we dance. I wonder if it would be tougher to get buy in if you implemented it in January. And I also told them, if you can’t dance, just move your hands and feet. I have a few lame ones that just stand around, shaking their hands and feet…but the vast majority not only dance, but they love it! And the few who moan and complain, I’m 98% certain that they’re just pretending to hate BAILE VIERNES, and secretly they love it. Kids seem to enjoy the Just Dance videos the most, and get frustrated with the ones that are too hard or too complicated. My Spanish 4s love dancing more than my Spanish 1s. I can’t explain it but my 4s are Dancing Maniacs. Just watch how adorable they are! Turning the lights off seems to make them more comfortable. Being Deskless makes Baile Viernes super easy… if you’re on the fence about tossing your desks, here’s another reason to do it! Thanks for your inspiration! I did Baila viernes for the first time ever today and it was a huge success. Simple & low prep with tremendously positive results. Your excellent youtube search suggestions helped me find a zumba version of our song of the week, Llueve el amor by Tito el bambino. I projected a slide that said ¡Baila viernes! ¡Levantense a bailar! and prompted students to “Mueven los pupitres para más espacio”. My Spanish 3s jumped right in. I even heard a “This is fun!” and “We should take a zumba class” and groaning when I told them to sit down after the song. Our Spanish 1 song was El pollito pio which is a little challenging but also enjoyable because they song is a hit. ¡Muchas gracias! Yay!!! Baile viernes is the best!!! !